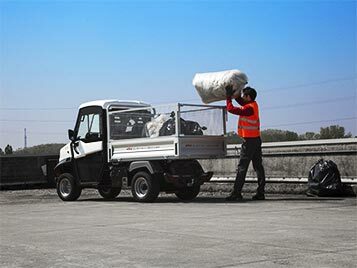 Work electric vehicles with steel mesh sides to increase loading capacity. 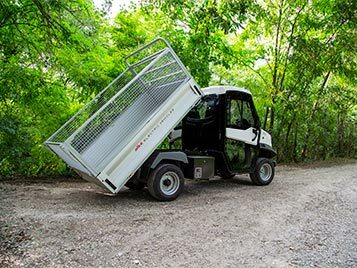 Alkè electric vehicles with cargo bed and steel mesh sides are used for the green and waste management, for the transport of miscellaneous goods and also in the tourist sector. The steel mesh sides can be installed on every Alkè ATX model and all the versions. Collection and carriage of dirty laundry in hotels, residences, holiday villages and hospitals. Collection and transport of trash bags in waste management. Collection and carriage of leaves and wood in the management of public and nature parks. Collection and transport of fruit and vegetables in markets, farms, vineyards, greenhouses and plant nurseries. The steel mesh sides protect the goods during the transport, avoiding the lateral falling during the maneuvers. Also, they allow greater load on the platform, increasing the possibility of vertical storage. 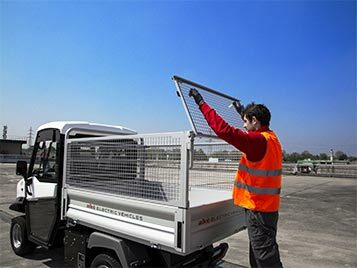 The steel mesh sides for ATX are entirely made of steel, with a height of 55 cm (21,65'') and are designed for the loading bed long 180 cm (70,87'') or 130 cm (51,18'') with compass opening rear drop side. All Alkè ATX vehicles are completely eletric. This factor, definitely not neglectable, implies a drastic reduction in the management cost of the vehicles, eliminating at all the cost of fuel; every Alkè electric vehicle has an energy recovery motor brake system, which, in stopping phase, prevents all waste of power and wear of brakes. A full charge has a cost of about € 2 and the vehicle will operate for an entire working day. Reduce the costs and maximize the productivity are key aspects for a company, big or small, but in the same way also the image has its value. Choose to buy an electric vehicle is primarily an ecological choice that communicates and transmits positive values through environmental interest, attention to resources and green commitment. Alké ATX electric vehicles can be used both in private areas and on public roads, as they are road type-approved vehicles. All Alkè vehicles are 100% made in Italy and designed for the use in hardest and toughest conditions. The vehicle's autonomy on standard routes can be up to 150 km with lithium batteries, so you can easily face a full working day. The energy performance remains optimal even in all those situations that require repeated stops for frequent loading-unloading operations.